Modulus is the first ever all-in-one solution for quality home theater systems. It combines a DVR, Blu-Ray/DVD/CD player, networked movie server, streaming video and music, and personal media organizer into one. No more switching inputs! Upload your music, movies, and family media to enjoy ALL your content in our elegant, proprietary user interface with an enormous 12TB of storage. The amazing voice-controlled universal remote makes search a breeze. The ultimate in quality, Modulus supports 4K, allows you to skip commercials, record your streaming content, and view all your media across any room in the house. Modulus is the creation of Steven Schulz, an Austin, TX tech executive and entrepreneur. Steve was formerly with Texas Instruments for 19 years before becoming president and CEO of Si2, a global electronics consortium. Steve’s vision and ingenuity has driven the project since inception but he is quick to share credit with a team of talented software developers and engineers. In total the Modulus platform is built on seven years of proprietary software development and 26 million lines of code. When will Modulus be available? Modulus will be ready for sale in Q4, 2018. Where can I buy a Modulus system? Does Modulus replace my cable company DVR? Yes, the Digital Video Recorder in Modulus is far superior to the restrictive, low quality units that cable companies typically provide. Modulus allows you to skip commercials, record streaming, watch your programs quickly in “Time Save Mode” and record up to six programs at the same time. The Program Guide that comes with your Modulus DVR includes everything that cable company DVRs provides, with more information and easy-to-browse screens. How do I play my content throughout my house? By using the Modulus Mx1. The Mx1 is much smaller than the main M1 unit, and fits easily behind the screen of any wall-mounted TV screen. The Mx1 is perfect for sharing your content in any room, on the patio, or even a garage apartment. The Mx1 comes with the same remote control and delivers the same experience as the M1 device. Will Modulus fit in with the other components in my equipment stack? Yes. With its colorful light display Modulus looks great sitting on any media table, but also fits in with any equipment stack. We provide a 2U accessory for rack mounting the M1 unit. Modulus is low power in operation and also stays cool. How do I upload all my personal media to Modulus? Easy! First, you can upload using our Blu-ray/DVD/CD player with convenient front-loading slot. Second, you can attach your video camera or smartphone using our custom Modulus adaptors and upload direct from the device. 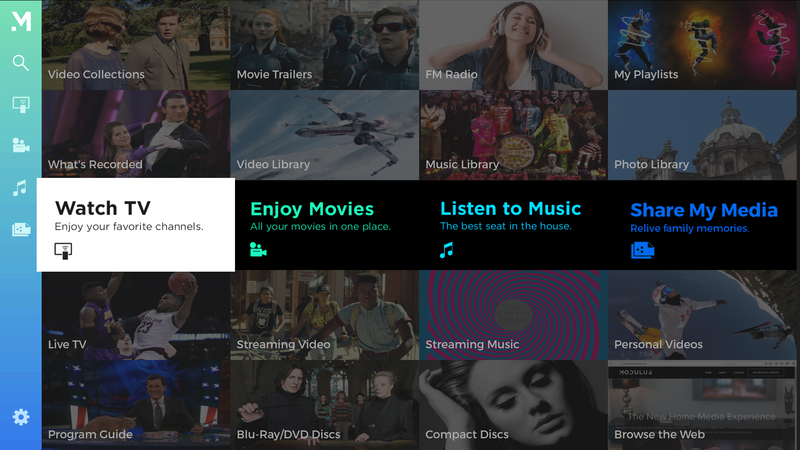 Modulus also supports Netfolders that connect network accessible media in your home. We support flash drives and external USB drives as well as downloaded content. Modulus stores all your media on its massive 12TB hard drive, and also redundantly in the cloud.